Some could argue that every day is Winnie the Pooh Day at Sacrewell, as we have a fantastic bridge which is perfect for Poohsticks. For those of you who don’t know what Poohsticks is, it’s a game invented by Pooh where you drop two sticks into a river (upstream) and wait on the other side of the bridge to see whose stick comes out from under the bridge first. It’s a game that can be played in groups or on your own. 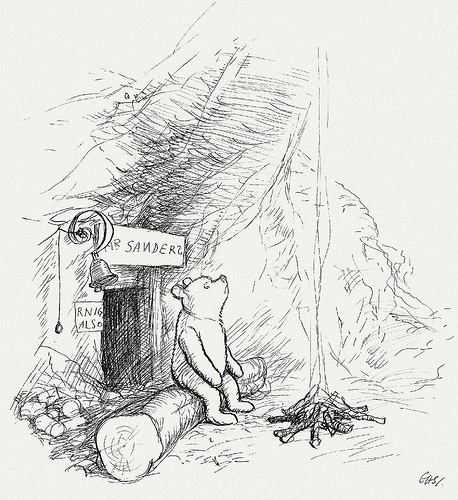 Yesterday (17 January) we celebrated Winnie the Pooh Day to mark the birthday of Pooh creator A. A. Milne, who was born on 18 January, 1882. We transformed Sacrewell into the 100 Acre Wood (where Pooh lives) for the day and created a trail around the farm to find missing words to complete a poem. We also had Poohstick races and story time, reading some of Milne’s famous poetry. The poem we chose was Us Two as it’s about an adventure and a journey, encountering wildlife and solving problems, which we think sums up a great family day out.